This page about planning a diet for gout sufferers is now superseded by the Diet For Gout Sufferers Guidelines. Many of the points covered below are still relevant to gout sufferers, and so I have retained the page for your interest. To plan a successful diet for gout sufferers, you need to make changes slowly. Drastic changes to your diet can stress your body and raise uric acid levels, so the GoutPal diet concentrates on gradual improvements. Before you start, you should study gout diet principles and the role of exercise and metabolism in a diet for gout. This will help you understand why a good diet for gout sufferers is not simply lists of foods you can and cannot eat. It is all about choosing better foods gradually. Until those food choices become new eating habits. This is true whether you are seeking to lose weight or not. The GoutPal diet is all about making small improvements, and if you apply this to weight loss you will slowly lose weight, and that weight will not come back. I use several nutrition tables to find better food. This does not mean that you have to spend hours analyzing all the food you eat. Just concentrate on improving the things you eat most – this will make the biggest impact for the least change. For example, if you eat a lot of bread, you can look at ways to substitute some of that bread with other foods that will give you a healthier diet. You’ll be amazed at how a few small changes make a big improvement to your health. If you really don’t want to check through the numbers, you can always tell me about your diet, and I will look for improvements. Though controversial, I believe a diet that mixes acid producing and alkaline producing foods in the right way can help gout. Scientific research is not conclusive, but I have seen improvement for myself. If you are not convinced, just skip this – there are other factors in the GoutPal Diet that you will benefit from. In a nutshell, you take the main food that you want to eat, such as meat, fish or cheese, and balance it with a sufficient quantity of alkaline producing foods such as fruit or vegetables. I am moving the Food Facts Section of my website, including acid / alkali food tables to a new food diary website. Many foods contain natural anti-inflammatory compounds. Perhaps the best known for gout sufferers is the cherry. But there are hundreds more. Now, a diet purely based on these will satisfy nobody, but all you have to do is ensure that the overall total of your food is anti-inflammatory. I plan to improve my food diary database to include inflammation factors in the diet analysis. If this is important to you, please share your views on important food diary features. The problem with most of these is that they don’t always stop you from eating more. If you feel hungry, you will tend to eat. But if you gradually change some of your food choices to ones that help you eat less then you will naturally lose weight. Again, I will improve the features of your food diary to include factors that influence satiety. Only you can determine which features I should concentrate on first, so make sure that you share your views on important food diary features. For a gout diet to be successful, it needs to consider many factors. But to be sustainable, you need to change things gradually and develop new habits. Start by understanding key facts about gout then decide if you need to lose weight as well as develop gout-friendly eating habits. Introduce small lifestyle changes and food choice improvements each week, to reinforce these habits. Before you know it you’ll be healthier, fitter, and less prone to gout attacks. Do you have recipes to help build a diet for gout sufferers? Do you have any questions about a diet for gout sufferers? 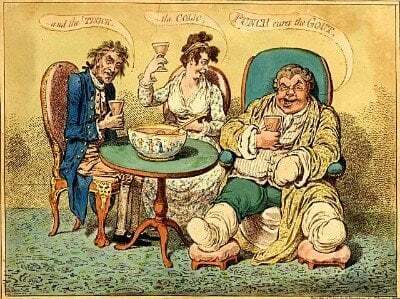 Please discuss your diet for gout sufferers on the Gout Diet Forum. Leave Planning A Diet For Gout Sufferers to browse Diet For Gout Sufferers Guidelines.